The link for our SCYMF Facebook page was incorrect. Here are the correct links. 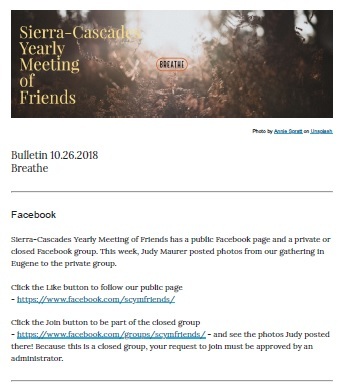 To follow Sierra-Cascades Yearly Meeting of Friends on Facebook, visit https://www.facebook.com/scymfriends/ and Like the page. To be part of the Facebook group for Sierra-Cascades Yearly Meeting of Friends, visit https://www.facebook.com/groups/scymfriends/ and Join. Please be patient with us. This is a closed group, so all requests to join must be approved by an administrator.